You’re good at what you do – right? You’re products and services are ‘best in class’. But how do you convince prospective clients or customers of this? How do you build the necessary trust and rapport with them and build that all essential credibility? Testimonials, reviews and recommendations are by far the best source of credibility, but if you are just starting out it can be hard to gain enough of these to really make a difference. And they may not show the breadth and depth of your offerings. A great approach is to showcase your knowledge and capabilities by delivering value to your prospects free of charge. And the easiest way to do that is blogging about the business you are in. Notice I said about the business you are in and NOT about your business. Your prospects are not interested in your business (at least not yet). But they are interested in the business you are in. Because you’re in the business of solving their problems. Of taking away their pain. Of providing the benefits they need. They just don’t know that you can do that yet. So you’re going to tell them – through your blog. Blogging has been around since the internet started. It started with hobbyists using the internet as an outlet to share their thoughts, views and knowledge on their hobbies. Some started to turn this into a business by writing about subjects people would pay for like stock market tips, of technical help in the early days of personal computing. Some charged for their best stuff and others sought to monetise their blogs through banner ads. Then companies big and small cottoned on to the idea that a blog was a great way to engage with their clients and prospects. The market became crowded with lots of ‘me too’ blogs either focussed on the companies themselves or on generic industry news and tips – just look at the websites of the accountancy firms and budget time – they all blog their assessment of what the chancellor has announced. Most of these blogs are just noise and provide very little real value to the reader. For you, that’s both good news and bad. It’s good news because if your blog really delivers value to your prospects it’s easy to stand out. The bad news is, how do you get noticed in amongst all the dross. 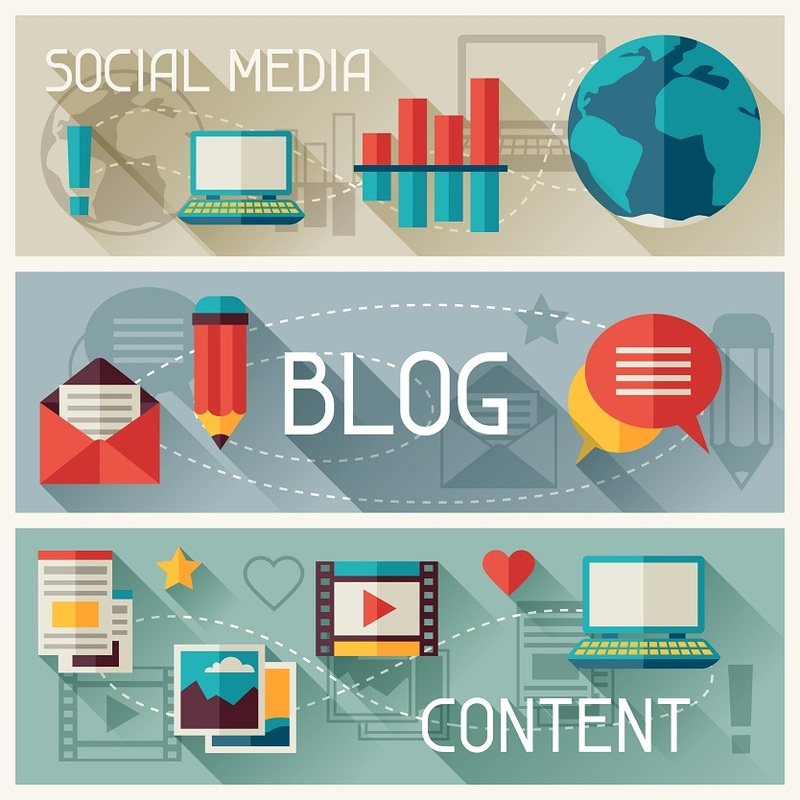 Let’s focus on the content of your blog first. Once we get someone to look at your blog we want it to have the wow factor to keep them coming back and also telling other people about it. Your content needs to focus not on what your business does, but what your knowledge can do to help your prospective client. One of my blogs is about everything to do with project management. I have a business that offers project management consulting and training, but I rarely mention either of those business aspects in that blog. Instead I focus each blog post on a potential problem area and discuss the causes and potential solutions for the problem. I’ll weave in examples of how I have dealt with similar situations for my clients. I use the post to demonstrate my understanding of the problem and how my experience can be used to find and implement solutions. All the while I am giving real world examples and demonstrating my knowledge and capabilities. Some business owners think they will struggle to find suitable topics or material to write interesting or informative blog posts. But that is often because they are thinking of blogging about their businesses and not the problems and pains of their prospects. Turn your thinking on its head and things will become clearer and easier. 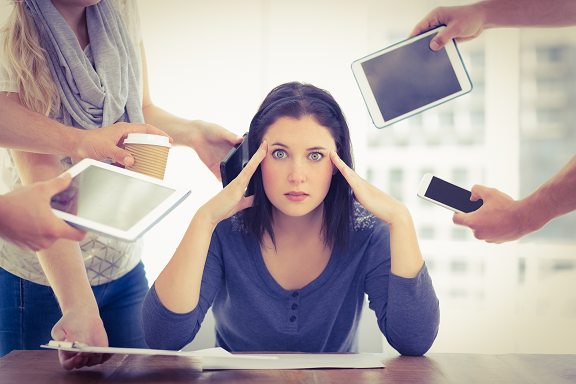 Look at what’s happening in your business right now. This post was inspired by a conversation after a related talk. Many of my project management blog posts are inspired by situations I see in my consulting or training. I use Evernote or OneNote to note down blog ideas or clip web pages or articles that could form the basis of a post. I sync the notebooks between all my devices so I always have somewhere to capture an idea when I get inspired. There are no right answers here, but plenty of wrong ones! Blogging once every three months isn’t going to get you a following or build much credibility. I think it has to be at least monthly and preferably weekly. But don’t set yourself up to fail. Consistency will build your credibility much more than random intermittent bursts of posts. So create a plan and map out your posts. Pace yourself and you won’t run out of gas. How long should your posts be? Short enough to keep your reader interested, but long enough to demonstrate your knowledge and understanding. It will depend on the subject matter. Some people get hung up about optimising their posts for Google and the other search engines. That requires writing anything from 1000 to 1600 words per post. That can be daunting when starting out on a regular blog and could stifle your enthusiasm very quickly. I write for my audience – any hits as a result of searches are a bonus. One of the most frequently read blog posts is Seth Godin’s. Most of his are less than 300 words. Ironically – this post is turning in to one of my longest. Great content is worthless if nobody reads it. So how do you get your wisdom in front of your ideal prospects. I use social media – primarily Twitter and LinkedIn. For Twitter I look for where my target audience hand out. For small business owners I will target small business organisations such as chambers of commerce and organisations like The Best of…. I follow the people that follow them and invariably get a high percentage of people following me back. Once I have followers I tweet about my blog posts to grow my readership. If you want to learn more about how to grow your Twitter following read my blog post “6 steps to growing your twitter following“. LinkedIn is a lot more targeted. I deliberately connect with my target audience. Once connected they get my status notifications, including details of all my new blog posts. I addition I join groups that my target audiences belong to – it’s where they hang out. I then post links to my blog posts in those groups. All informational – no selling. Look at my blog post “Making the selling easy” which talks about using LinkedIn to make it easier to sell to your targets. If you are reading this on the first day of posting there may still be time to sign up for my free webinar on the same subject. Click here to find out more. So that’s great content created and two excellent ways to share it. Expert authority on its way. Isn’t it interesting how many of the ‘super successful’ suggest that ‘stealing’ is not only acceptable but should be encouraged! I prefer to call it swipe and deploy. But in essence it’s stealing someone’s idea, modifying it for your own use and deploying it in your business. It’s a practice that not only is encouraged for the writers amongst us, but for the business owners and entrepreneurs. Steve Jobs identified this when he said “We have always been shameless about stealing great ideas”. Take the iPhone – mobile phones had been around for quite a while but Apple took the idea and gave that extra something to make a ‘new’ product. It made calls and sent and received texts like all mobile phones but it did much more. 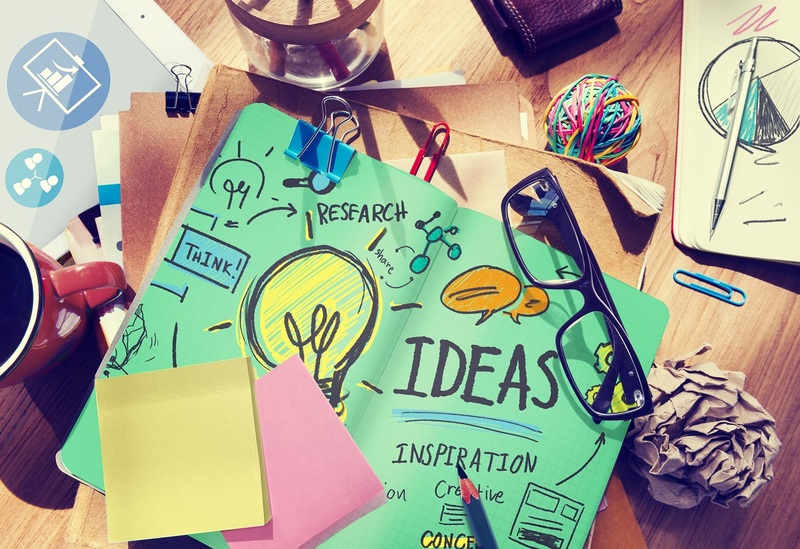 Inspirational creative minds know that using the ideas from others, building on them, and making them your own is a great way to improve your own work. Swipe and deploy! Where do you find these ideas to swipe and deploy? They are all around you. Newspapers provide the best source of headlines for your e-mails, blogs and marketing pieces. The Sun and the Daily Mail often produce the most eye-catching. Subscribe top your competitors e-mail lists and get ideas from them. Look for other companies that are great at engaging with their customers. They may be in very different industries but the ability to use material and cross over to your business is immense. 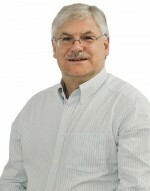 I listened to a presentation by Ben Hunt-Davis entitled “Will it make the boat go faster”. It was all about how he and his team won Gold in the rowing 8 at the Sydney Olympics. Nothing to do with business per se, but it inspired my own blog article (click here to read) about how the same philosophy can be used to improve your businesses performance. Even this blog post is a shameless swipe from a colleagues e-mail. Yes, I’ve broadened and deepened the content. But the idea was swiped and deployed. I belong to several entrepreneurial groups and one of the key things they distribute each month is material specifically to be swiped and deployed. They even call them the swipe files. I also maintain my own swipe file. Anything I see in print that could be tweaked and applied in my business get’s indexed and squirrelled away for future use. For online stuff I use Evernote or OneNote to swipe electronic copies. Here are two immediate examples of things you can swipe and deploy. Both relate to growing your network and connecting and engaging with your audience which is a creative endeavour. Firstly, take the advice of the successful creative types and swipe my tips and tactics on growing your network from my new guide – How to Connect With Anyone in The World. With over 400 million members in the world’s largest professional network, LinkedIn owns this business space. The guide will show you how you can connect with your ideal targets. To connect and engage with anyone, anywhere click here to get your free download. Now an essential element in the connection puzzle is having a Powerful Personal Profile. So swipe and deploy no.2 is to join my free webinar and get some hands on tips for doing just that. Click here for my Making the selling easy with LinkedIn webinar. So two great things for you to swipe and deploy in your business to grow your connections and make selling easier. Tell me a bout your own swipe and deploy experiences by leaving a comment on the blog. Technology is supposed to simplify things. To make them easier and quicker. But for marketing, technology has made things more complex and distracted businesses from what they need to focus on – the customer. Add to that leafletting and possibly local radio advertising and that was about it for a small business. Today there is e-mail marketing, Twitter, Facebook, Google search and ads, Instagram, Pinterest, podcasts, webcasts, Periscope – the list grows almost daily. But they’ve forgotten the key message from the old days – where their customers go. In the old days, if you wanted a plumber you’d go to the local edition of the Yellow Pages. A year or two ago, you’d have probably started with Google search. Today, you’re probably looking for recommendations so you’d start with Streetlife or Checkatrade. The key here is where are your potential customers going to look for your product or service. If it’s a product or service you need to make people aware of – that you want to prompt them to think about buying – where do those customers hang out in the biggest numbers? So the first thing to think about is your market, not your marketing. Who are you trying to speak to and where do they congregate? You need to be as specific as you can so that you can tailor and target the next part. You might say that anyone can benefit from your business but you can’t market to everyone at the same time with the same message. For example, let’s say you are in the weight loss business. Your marketing to post-childbirth mums needs to be very different to the over 50’s trying to lose that middle-age spread. Their reasons for buying will be different even though the ultimate goal is the same. Having identified the ‘who’ and where that who is (or what technology they use) you can start to craft the message. This is where copywriting comes into its own. You need the right sort of headline to appeal to you ‘who’. You then need compelling messages well-crafted and laid out to draw the reader further into the piece. Finally you need a great offer or call to action. One that is a ‘no-brainer’ for the customer. So we’ve identified the market and the message. Only now do we consider the media. What media do your target market consume information on. How is your message best projected. As a general rule, images perform better than text alone and the right video can be the best performer. But the size and length must be driven by the market. The media is only the delivery mechanism, not the focus of the marketing. That’s why I like and recommend LinkedIn for any business selling to other businesses. LinkedIn announced recently it has hit 400m user profiles worldwide so you know your market is on there. The combination of niched Groups and LinkedIn’s powerful search capabilities, your target customers are easy to find and connect with. LinkedIn provides all the facilities you need to get you marketing messages across. And whereas the majority of e-mail marketing messages get deleted without a glance, most LinkedIn messages get opened and read. If you’d like to find out more about how to use LinkedIn to target your ideal clients join me for a free webinar – “LinkedIn – making the selling easy“. Just click the link to register. 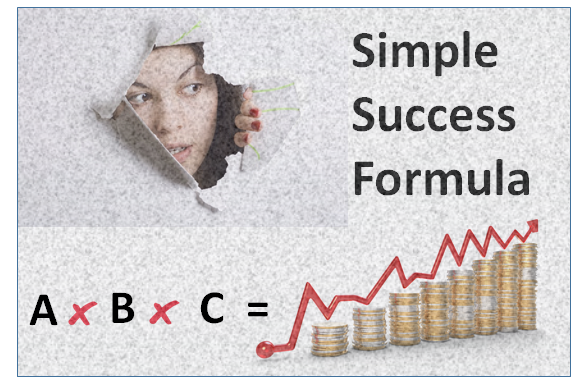 Can success be distilled down into a simple formula? Is there a silver bullet or bullets that you can load up and use to fire your business to growth and profitability? That’s a ‘yes’ to both questions. Why am I sharing this for free? Well, the formula is simple and the bullets are readily available in every business. But success only comes with implementation. And I help people with implementation. So the more business owners that know the formula, the more I can help. MA = Massive Action: Nothing will happen in your business without taking action. The bigger the action, the more you can make happen. Let’s take an example. If you follow up with your leads once or twice (the typical rate of follow up) you are missing a huge amount of sales. Most people only buy on the 4th to 7th contact. So your massive action could be to follow up at least seven times. RS = Right Stuff: You can take massive action, but if you are doing it wrong, then you won’t get the right results. If your sales process is poor no amount of effort will secure sales. C = Consistency: You have to take massive action with the right stuff to achieve results. But if you only do it once, those results will be pretty small. You need to do it over and over again. R = Results: We gave a hint in consistency. The formula is a multiplier. If any component is small or zero it dramatically impacts the results. If you do the right stuff consistently but only a little of it, then you are not going to get huge results. Likewise, massive action of the right stuff done once will generate a blip in your business, but no more. You need to take action on all parts of the formula to achieve results. So now you know the simple success formula. But what about the silver bullets I mentioned? They exist in every business. From the one man band to the largest corporations. You and, if you have one, your team. You see the success formula – MA x RS x C = R – can only be implemented by people. Yes, there are marketing systems that can automate posts and follow up sequences. But people have to set them up. People have to right the copy. And when it comes to the sale, people like to buy from people. So it’s the people that make a business go round. It’s the people that make the difference between success and failure. So you and your people are the biggest asset in your business. Are you investing in yourself and your people? If you’d like to learn how to apply MA x RS x C = R to your use of LinkedIn, join me for a free webinar. Click here for more details.